The George Hevesy Medal Award is the premier international award of excellence in radioanalytical and nuclear chemistry. It is awarded to an individual in recognition of excellence through outstanding, sustained career achievements in the fields of pure as well as applied nuclear and radiochemistry, particularly applications to nuclear analytical chemistry. Established originally in 1968 by Prof. Dr. Dr. h.c. Tibor BRAUN, Editor-in-Chief of the Journal of Radioanalytical and Nuclear Chemistry (JRNC), the George Hevesy Medal Award has been given during 1968-86 to 19 distinguished individuals whose contributions have traced and defined the scope and depth of radioanalysis through prolific postwar years of the nuclear era. Their achievements ranged from pioneering radioactivation analysis methodology and applications, through development of radiochemical separation procedures and analytical schemes to radiotracer applications to analysis such as substoichiometric isotopic dilution analysis, automated and computerized systems, and widespread fields of application. This Award has been reactivated in 2000 by Professor Dr. Tibor BRAUN and Professor Dr. Amares CHATT. It is sponsored by JRNC. It was adjudicated by the International Committee on Activation Analysis/Modern Trends in Activation Analysis (ICAA/MTAA; web site: http://www.icaa-mtaa.org) during 2000-15 and by the JRNC Board of the Hevesy Award thereafter. The Award has no monetary value. The Hevesy Award comprises an engraved bronze medal and a citation which are presented at a major international radiochemical conference occurring in the year of the award. 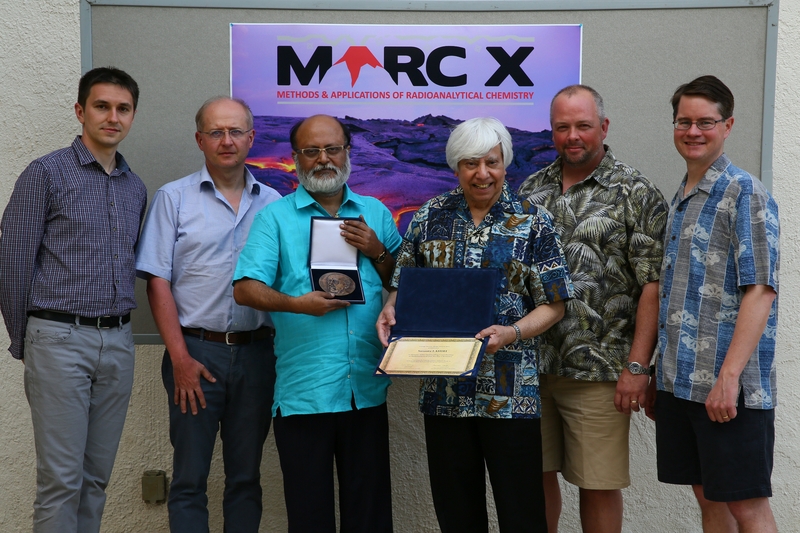 The 2015 Hevesy Medal Award was awarded to Prof. Dr. Susanta Lahiri of the Chemical Sciences Division, Saha Institute of Nuclear Physics, Kolkata, India at the Tenth International Conference on Methods and Applications of Radioanalytical Chemistry (MARC-X) held in Kona, Hawai, U.S.A. during 2015 April 12-17. Standing from left to right: Dr. Tibor G. Kocsor (Associate Editor / JRNC), Dr. Zsolt Revay (Editor-in-Chief / JRNC), Prof. Dr. Susanta Lahiri (2015 Hevesy Medal Awardee), Prof. Dr. Amares Chatt (Chair, JRNC Board of the Hevesy Award; Editor / JRNC), Dr. Samuel E. Glover (Program Chair MARC-X), and Dr. Stephen P. LaMont (General Chair MARC-X).